Now is the time for bird houses. Although they won’t be laying their eggs for a while yet, many song birds are already scouting likely nest sites and beginning to stake out their breeding territories. By setting out birdhouses now, you increase the odds of bluebirds, chickadees, titmice, or other cavity nesters setting up housekeeping in your garden. There are many many plans available for building your own birdhouse. Some are quaint and some are modern. Many are specific to one or two species. And, even more are impractical (but cute), offering no way to clean out old nests or check on eggs and nestlings. I prefer simple, easy-to-build, and functional. My resident bluebirds, chickadees and titmice all seem to agree. You can build this birdhouse from two pieces of wood using nothing more complicated than a handsaw, screwdriver and drill. A power saw will speed things up, but isn’t necessary. No fancy angles to cut with this basic-yet-functional design. 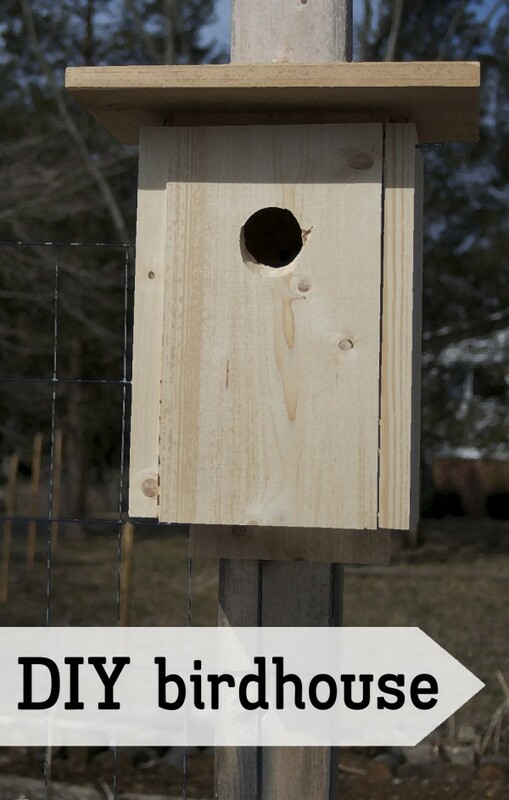 Note: This box works well for Eastern bluebirds, chickadees, titmice and many other cavity nesters. However, this box may be too small for mountain bluebirds and Western bluebirds. 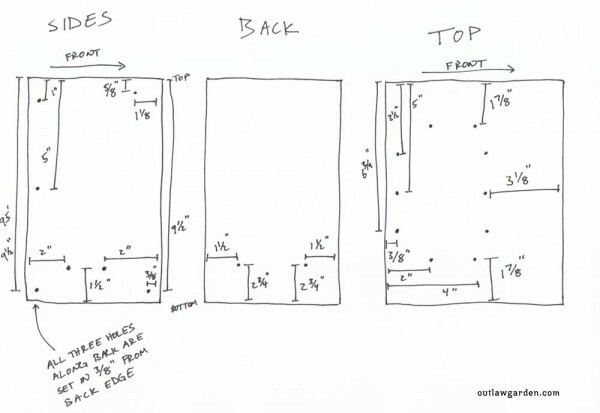 If you live in the western half of North America, you will want to modify this plan by using 1×8 lumber for the sides and a 1-9/16 inch drill bit for the entrance hole. All other dimensions can be kept the same. Another note: If you want to modify your box to fit the recommended dimensions of a specific species, this list provides some great detail: Nestbox specifications. Optional — build two birdhouses out of a single 8-foot board. If doing this, start by cutting the board in half, then follow the directions below. Once you have everything gathered, you can construct the entire bird house in approximately 30-60 minutes. First, cut your top piece to 10-inches by 8-inches. Then, cut your 4-foot 1×6-inch board as shown (click the image to view larger). Start your cutting with the front and sides, and work along to the back. Measure each piece as your cut it. 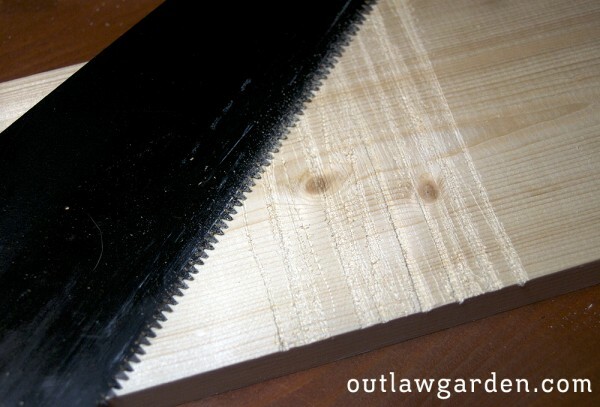 You do these two things because each cut will remove about 1/8-1/4 of an inch of wood from your board, depending upon the width of your saw blade. If you cut as shown below, your back piece will actually be a bit shorter than 12 inches. That’s totally fine. 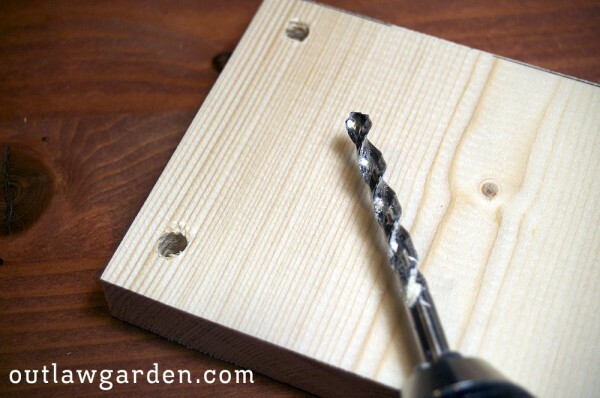 Using your 1/4-inch bit, drill a hole near each corner of the bottom piece. These will provide drainage if rainwater gets into the box. Be sure to drill from the top of the bottom piece — this ensures that any splinters will point out from the bottom of the box. Three holes along backside, to attach sides to back piece. 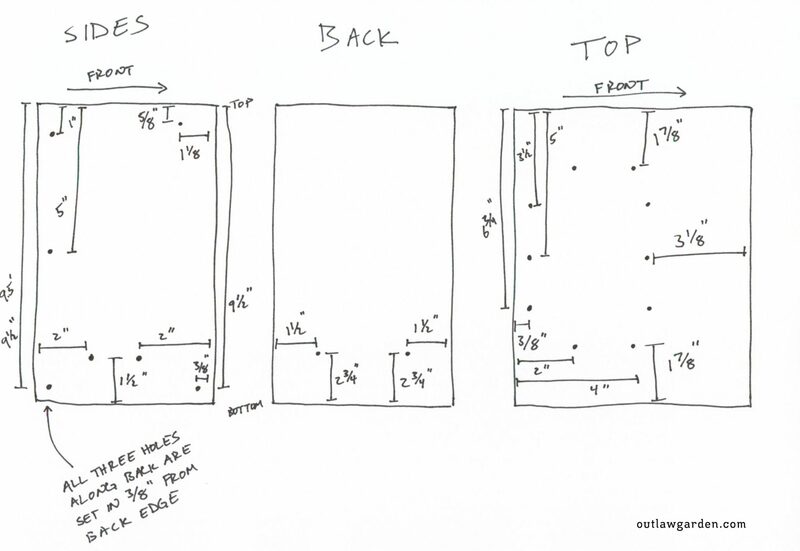 These holes should be set at 3/8-inch in from the back, and 1-, 5-, and 9.5-inches from the top. One hole at the top front corner, to attach the top brace. This hole should be set at 5/8-inch from the top and 1 1/8-inch from the front. Two holes near the bottom, to attach the bottom piece. These holes should be set at 1.5-inches from the bottom and 2-inches in from both the front and back. One hole near the bottom front corner, to attach the front piece with finishing nails. This hole should set at 3/8-inch in from the front and 9.5-inch from the top. Two holes near the bottom, to attach the bottom piece. These holes should be set at 2.75-inches from the bottom and 1.5-inches in from both sides. Using a pencil or pen, draw a line across the inside of the back piece, 1/2-inch from the top. Do the same with the top brace. Using your handsaw, power saw, or a nail head, scratch several horizontal gouges onto what will be the inside of the box front. Scratch up roughly 4-6 inches of vertical space in the center of the board. This roughens the surface, making it easier for nestlings to climb out of the box when they are ready to fledge. Doesn’t need to be pretty. Just functional. Finally, cut similar kerfs into the underside of the roof piece approximately 1/2-inch in from the front and both sides. This creates a drip line for rain, and stops rain from being wicked into the box. Attach both sides to the box, aligning each piece so that its top is 1/2-inch below the top of the back piece. You may find it helps to set the back on its side, and use the front piece to support each side as you attach it. 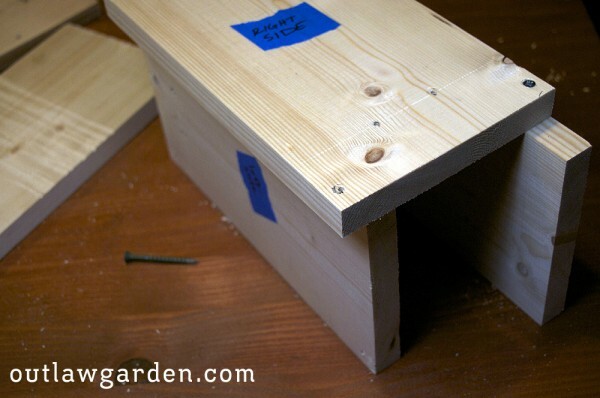 Attach the bottom to the back, aligning it with the pre-drilled screw holes and making sure that the bottom is situated so that any splinters point out of the box. The bottom piece should be snug, but should fit without forcing. Attach top to box. It should rest flush on the front and back pieces, aligned so that the back of the top meets the back of the back. There should be a half-inch gap between the top and sides on both sides. The gap allows for ventilation and makes it easier to check the box for wasp nests without opening it. Fit the front piece into its spot, aligning the bottom of the front piece with the bottoms of the two side pieces. There should be a small gap between the top of the front piece and the outer top of the box. This gap will be blocked by the top brace. While holding the front piece in place, use hammer to drive finishing nails into the two pre-drilled holes that align near the bottom of the front piece. These two finishing nails serve as the “hinge” for the front of the box, which will be your access door. With the front piece still aligned in place, screw the latch screw into its pre-drilled hole near the top of the front piece. 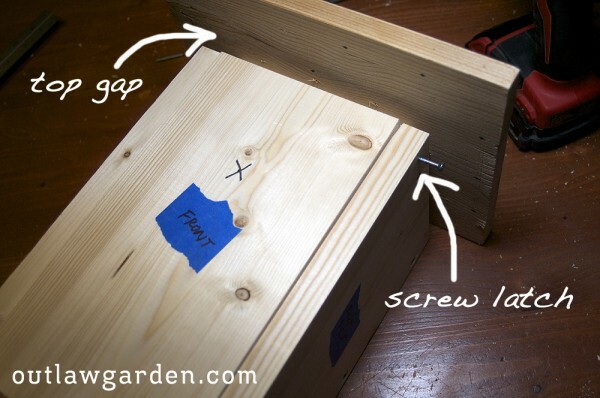 This will be your “latch.” Simply unscrew the screw when you want to look inside the box. Alternatively, you could use a hook-and-eye latch. However, be aware that some raccoons will figure out how to undo these latches. The screw does make it more difficult to check the box, but is also more secure. I recommend using a a screw, for added security. You do not need to insert this screw fully into the wood. Just screw it in far enough so that it secures the top of the front. You may use a screw at each top-front corner if you like. I generally use just one — it provides plenty of security. Now, you’re nearly done. Just one more step: the front door. Mark the front piece with an “X” centered at approximately 3 inches below the top of the front piece (as shown above). Using your 1.5-inch drill bit, create the entrance hole. When doing this, set the box on its back, and drill from the outside toward the inside. If possible, angle your drill so that the entrance hole slopes slightly upward from outside to inside. This helps prevent rainwater from dripping into the box. Be aware the some drill bits can bind when cutting holes of this size. 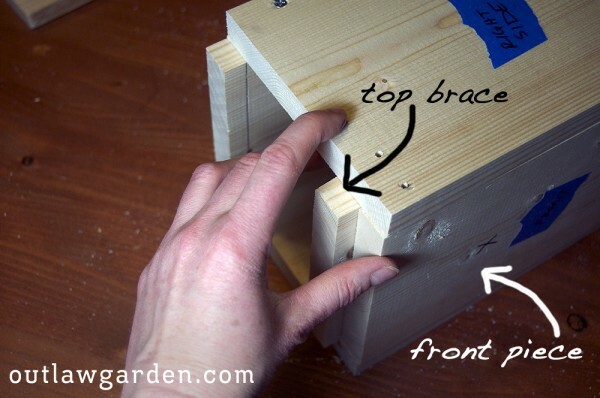 Secure the birdhouse firmly with your second hand, a helper’s hands or a set of clamps before drilling the entrance hole. Once you’ve drilled the entrance hole, open up the box and clean away any sharp splinters from the entrance. If desired, you can use a scrap of sandpaper to smooth the entrance hole. Just be sure you don’t sand so much that you actually enlarge the hole. Congratulations! You’ve built a birdhouse! Except. One more step. You’ve got to set that box out in the garden if you actually want birds to nest in it. This box is designed to be mounted to a tree trunk, fence post, the side of a building, or other structure. It can also be easily modified for mounting on a galvanized pipe, which makes it more difficult for predators to access the box. 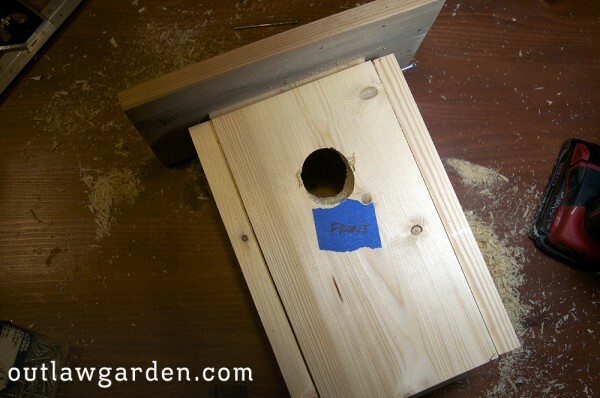 Once you’ve selected your site, take your birdhouse and two screws or nails out to mount it. I prefer screws, because they are easy to remove if/when relocating the box. Hold your box in its intended place. 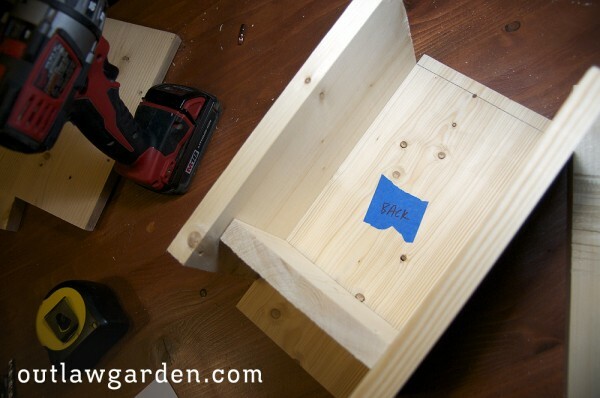 Open the front, and attach one screw through each pre-drilled hole in the back of the box. Close the front of the box, secure the latch, and you’re done! Please share your questions and suggestions below. 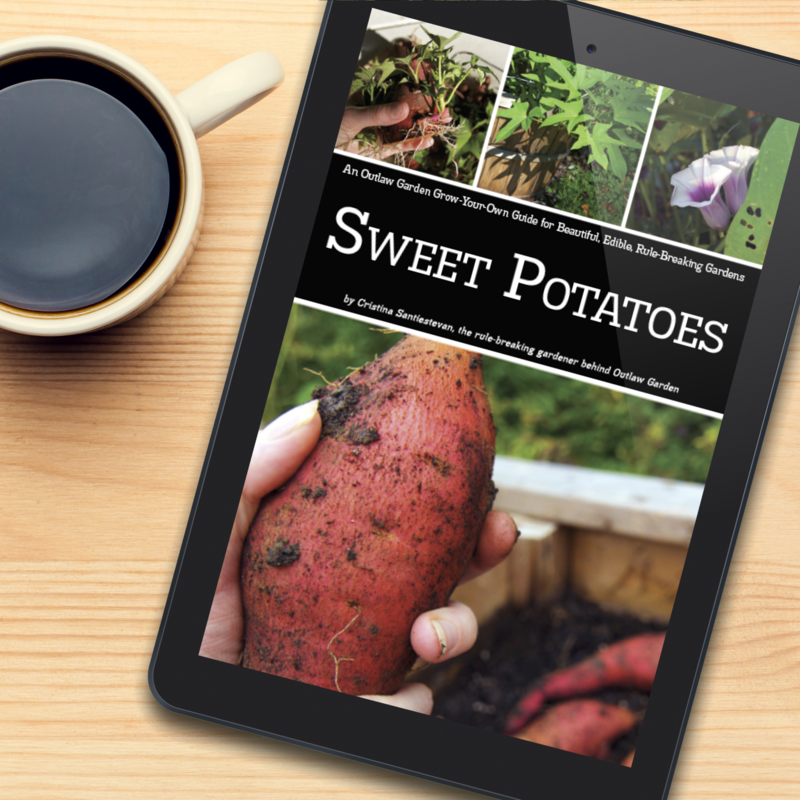 I’d love to hear about what’s worked for you in your garden! Click here to share a comment below. Thank you for the information, I will try this with my nephews. They are 9 and 11 years. The extra info for helping the birds get out. Awesome, thank you so much. Great! I love doing stuff like this with my nephews too. Aren’t nephews grand? 🙂 Give a holler if you have any questions, and good luck with the project. I just built my birdhouse. I love it! I’m just about to mount it. But 4-5 feet off the ground? I would think it would need to be higher. Hi Bonnie — To be honest, I’m not 100% sure. I’ve seen birds nest in some pretty unusual places, and suspect a painted birdhouse would not deter them. If you do choose to paint, you’ll want to be sure the birdhouse has sufficient ventilation, as I suspect it would reduce the breathability of the wood. Also, you probably don’t want to paint the interior — wouldn’t want any chicks ingesting paint chips. Good luck! And, if you do decide to paint your birdhouse, I’d love to hear how the birds respond.